We’ve longed admired Andy J Poyiadgi‘s work and the opportunity to create a comic with him was something we absolutely relished. It is, therefore, with much excitement that we are releasing his book this March. Andy has delivered a captivating tale; witty and imaginative. So before Lost Property officially hits the shops, we took the time to catch up with Andy and find out a little more about the man and his mind. I’ve always wanted to make comics. Here’s one of my earliest strips, age 9. I don’t think I even knew what comics were back then, they were just a few pictures side by side that told a funny story (usually involving a sleepwalking character). Despite studying illustration I never pursued it professionally. At some point during university I began to find drawing exhausting. I think this was due to an animation I worked on during my final year. It was hand drawn and painted and ridiculously laborious. 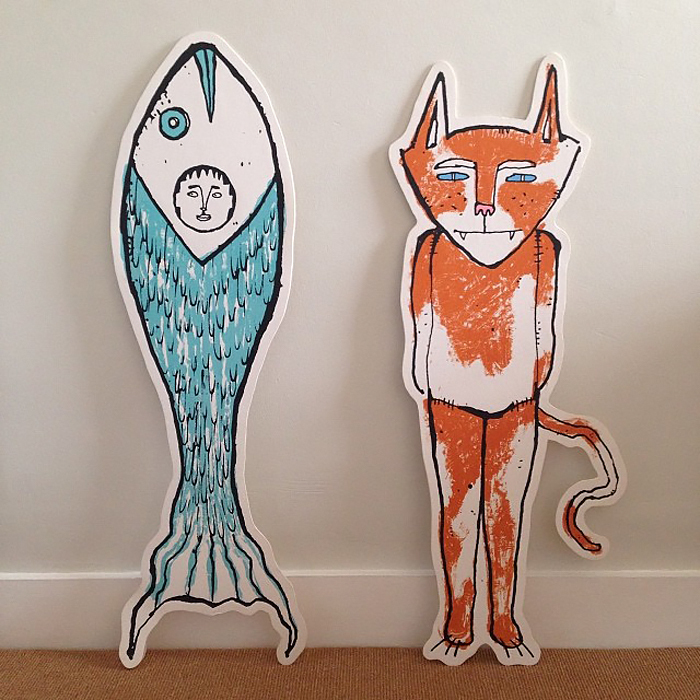 Here are two of the characters, turned into life-size screen prints. After the animation I turned my attention to live-action filmmaking and have since become a writer/director. 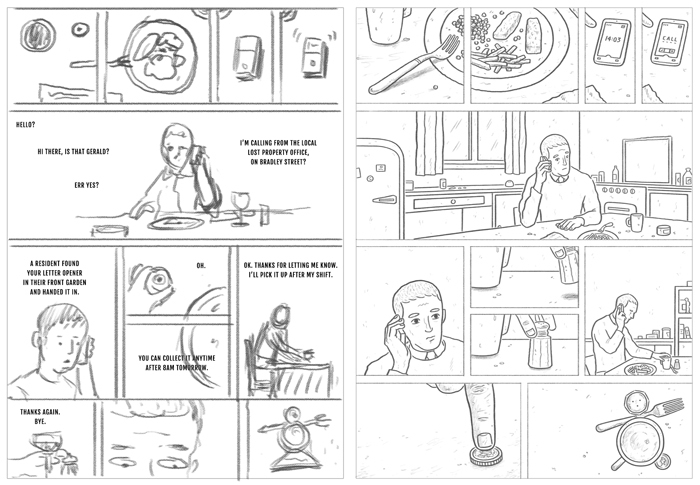 I’ve never stopped doodling but lacked the courage to put anything out there, till I decided to enter the Observer/Jonathan Cape/Comica Graphic Short Story Prize. This was an attempt to get something finished, a complete, short story. The result was Teapot Therapy and I used real tea (English Breakfast, strongly brewed) for the background textures. The idea for Lost Property came about while chatting with a friend. It started out as a ‘what if?’. 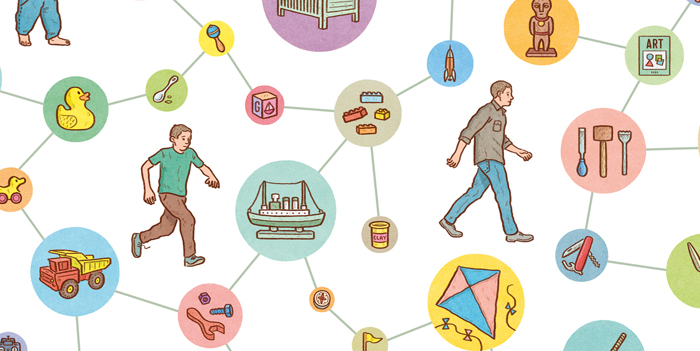 What if you found every object you ever owned hidden in the same place? The idea remained undeveloped until years later, when I was looking for a story to fit Nobrow’s 17×23 series. It took me a while to figure out the point of the story, why this strange event was taking place. But there was something alluring about the idea of finding all of your past, in physical form, collected in one room. I imagined it being like a jumbled map of your life; one that makes you reflect on the journey you’ve been on. Here are some initial sketches for the setting. 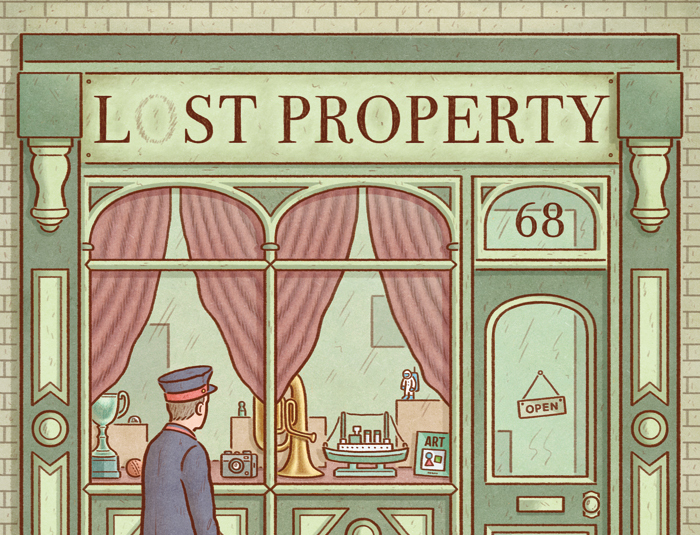 At one point I toyed with it being a bric-a-brac store, but a lost property office made more sense once the story began to take shape. Some early doodles of the main character, Gerald. 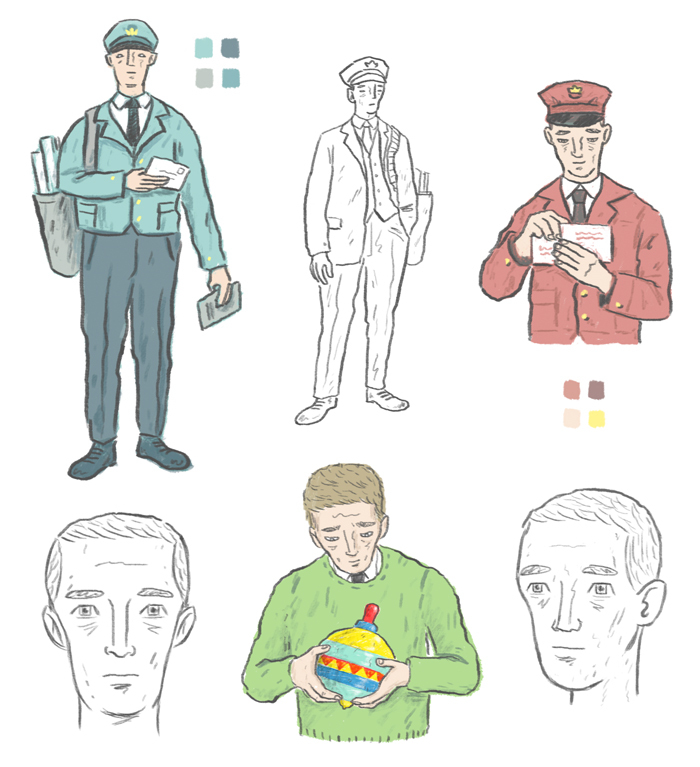 I liked the idea of him being a postman; he spends his days delivering objects to people, while other people are delivering his objects to the lost property office. I plan the story with words first, almost like a screenplay, with page and scene breakdowns. 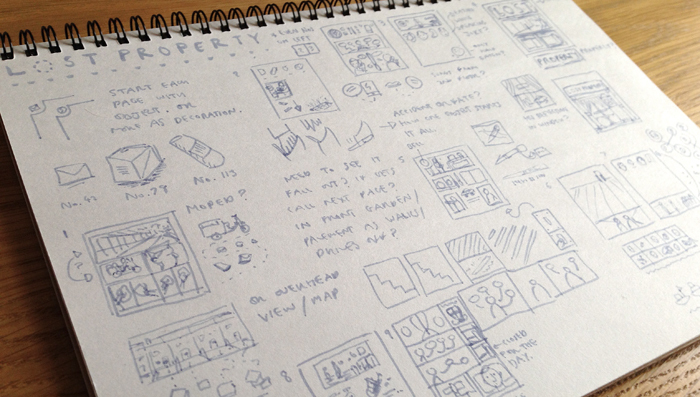 Then it’s time for thumbnails. 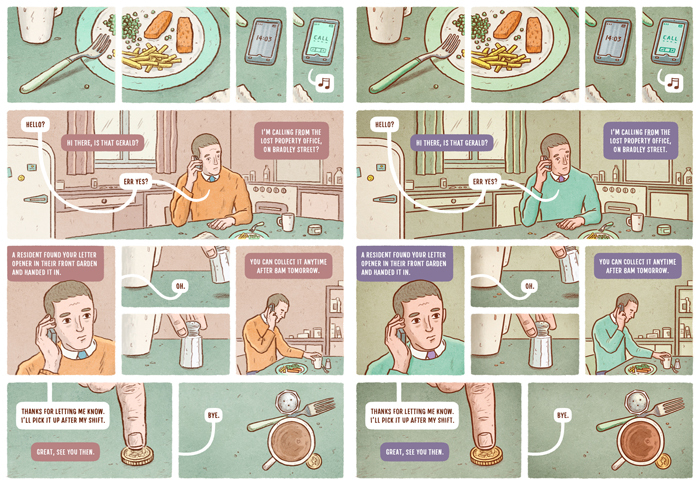 At this stage it’s always a tug of war between simple storytelling and appealing art. Simple storytelling usually wins out as it does all the work, while appealing art stands there and looks good. 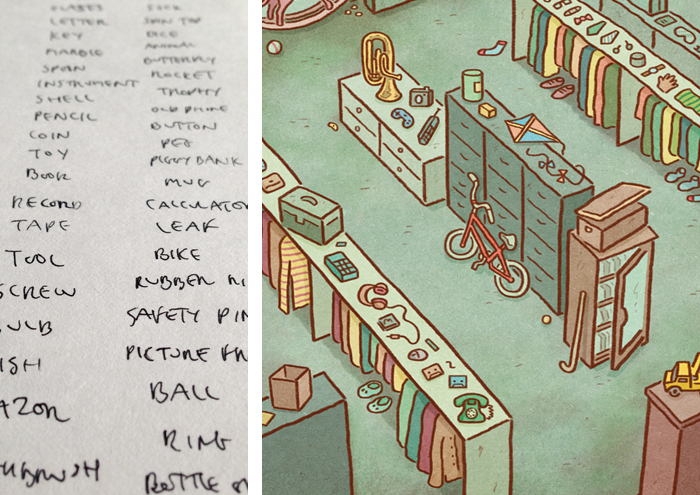 A fun element was listing Gerald’s past possessions. It was like creating the character’s backstory through the objects he once owned. The tricky bit was drawing all of the objects in the space – filling the shelves and cupboards with appropriate items. I liked the idea of using two contrasting colours for the lost property office – one for the small office upstairs and another for the large storage downstairs. I ended up with a warm palette for upstairs and a cool palette for downstairs. The blueish-green basement began to feel like the bottom of the ocean – a cold, gloomy place concealing all sorts of personal treasures. …to full colour. 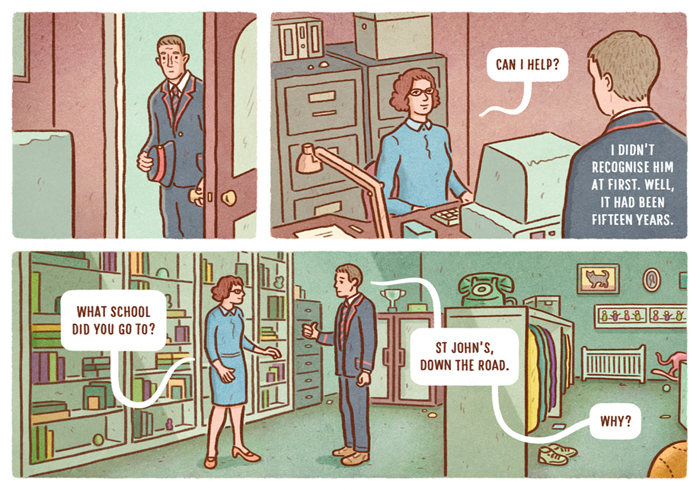 The page on the left was a first attempt at colouring, which I changed after the lost property office took on a similar palette. Cheers to everyone at Nobrow for their support while making the book. I’ll finish off with a teaser video that I made for it, featuring a track created by Slancio Music (http://www.slanciomusic.com/).